With this is mind its understandable that Daniel was called upon to work with some of the scenes most credible producers, with him remixing tracks for the likes of: Tiësto, Deadmau5, The Crystal Method, W&W, Allure, JES, Andain, Leon Bolier, The thrillseekers, Super8 & Tab, Andy Moor, Taste Experience and many more. Daniel has works with & released on such labels as Spinnin’ Records, Mixmash, Armada, Black Hole Recordings, EMI, Magik Muzik to name a few…. achievements that most artists can only dream of in such a short space of time. A wish to see his tracks working from the perspective of the DJ booth along with a desire to travel the globe prompted Daniel to take the DJing plunge. Daniel threw himself headfirst into his performances, spinning at the legendary Heineken Hall in Amsterdam, Trance Energy – Holland, Winter Music Conference – USA, Technoparade – France, The Point (TIËSTO tour) – Ireland, Es Paradis in Ibiza, Eden – Ibiza, FFWD Dance Parade – Holland, Hellinikon Complex (TIËSTO tour) – Greece, Luxy – Taipei, Oslo Streetparade – Norway, Monday Bar Cruise – Sweden, Brixton Academy – England, Carling Academy – Scotland, Suikerrock – Belgium, Halo – South Africa, Rising Festival Malaysia, Mysterious World – Indonesia and many many more, Daniel even toured around Europe with Tiësto – playing to over 15,000 strong crowds across the World! ….. ENJOY Hailing from the flatlands of Dordrecht, Southern Holland, Daniel Wanrooy has been influencing the playlists of some of the world’s biggest & best artists for the last decade. Both as a solo artist and half of the hailed duos Progression & Odyssee, his evocative, imaginative music has successfully cross-bred virtually every subgenre of nowadays Electronic Dance Music. His music got support by Tiësto, Hardwell, Armin van Buuren, Dimitri Vegas & Like Mike, Sander van Doorn, Ferry Corsten and many more! 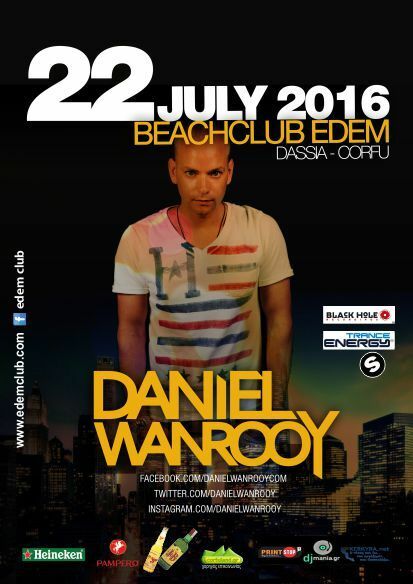 Daniel Wanrooy @ edem club ! FREE ENTRANCE !! !